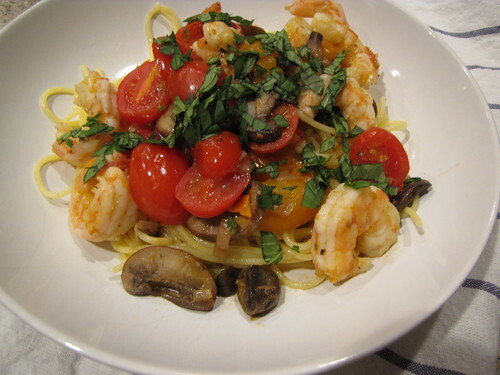 Linguine with Shrimp & Little Tomatoes is a recipe that my dad and I created back when I had a big garden and by this time of the summer was over run with little tomatoes. Whether they are traditional red cherry tomatoes, pear shaped yellow tomatoes, plum shaped red, those awesome little gold sun sweet tomatoes, or the new fancy tiny mulitcolored heirlooms, any little tomatoes will do. You’ll get the best flavor and pop of extra color if you can use 2 varieties. As with most of my shrimp dishes, I use wild caught shrimp. I always try to have a few pounds in the freezer for last minute meals since you can thaw the shrimp out in a bowl of cool water in several minutes. 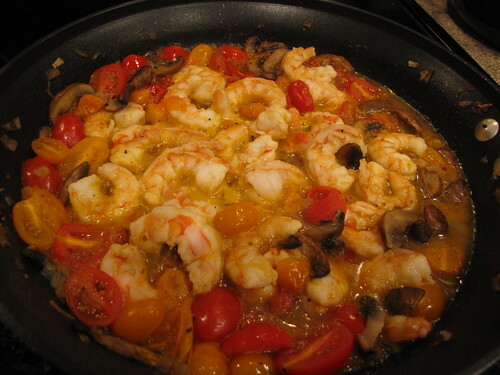 And because shrimp cook extremely quickly, this makes a great weeknight meal. You can easily have this on the table in 20-30 minutes. Linguine (or other long pasta), Shrimp, Little Tomatoes (red & yellow), Mushrooms, Shallot, Fresh Basil, White Wine, Olive Oil, Parmesan/Romano Cheese, Salt & Pepper. Because this cooks very quickly, be sure to start your pot of water boiling for the pasta at the same time, if not before, you start your sauce. 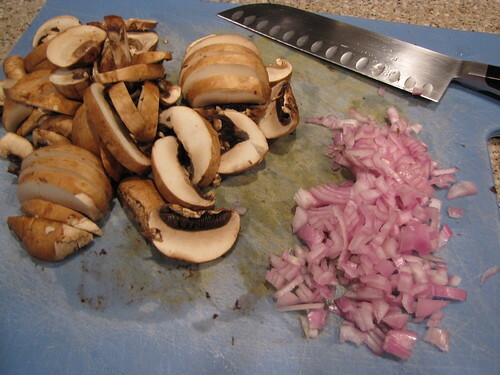 Finely chop 1 large shallot and slice 8 ounces of mushrooms. I’m using baby bella mushrooms but regular white button mushrooms are fine too. 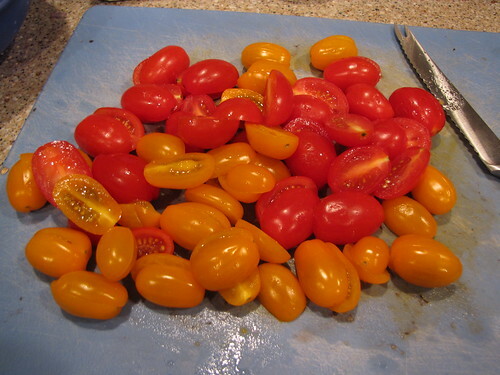 If your tomatoes are extremely small you can leave them whole but prick them with a sharp knife so they release their juices. Exact proportions are not that important with this recipe. Feel free to add more or less of something if you’d like. Sometimes I also throw in a few handfuls of fresh spinach. One time I added white cannellini beans. Most of the time I like to keep it pared down and simple as shown here. 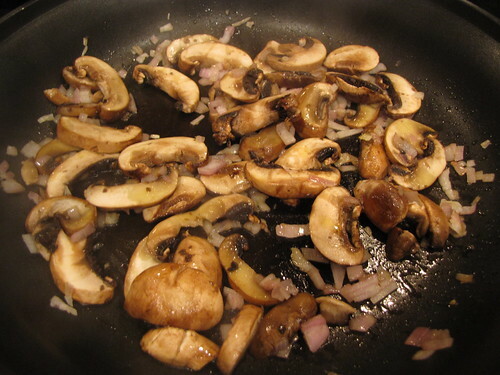 Heat 2 Tablespoons of olive oil in a large skillet and sauté the shallots and mushrooms on medium high heat. 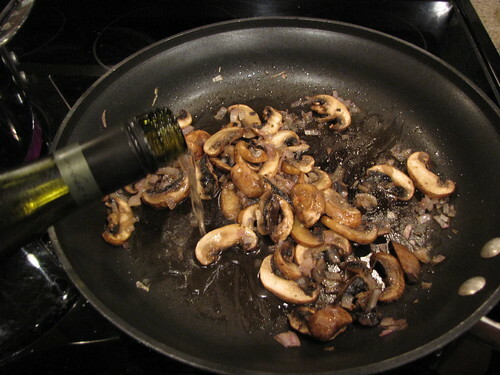 When the mushrooms have given off their liquid and are nicely browned, add ½ cup dry white wine. Scrape up any bits from the bottom of the pan. If you have not already added your pasta to the pot of salted, boiling water, stop the sauce here (before adding the tomatoes) and get the pasta going. For 4 servings I use ¾-1 pound of pasta. The Gluten Free pasta all comes in ¾ pound boxes which is sort of annoying. If you are using a full pound of pasta, you might need a little more white wine or even just a bit of pasta water to make enough sauce. When the pasta is in the pot, add the tomatoes to the pan. 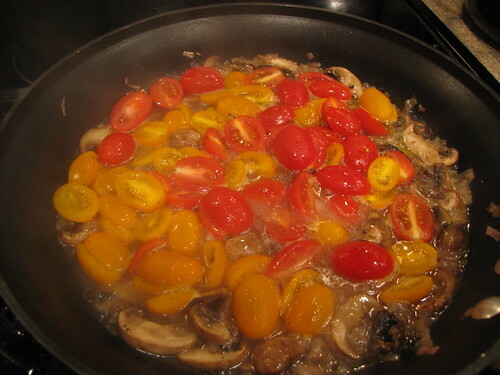 Turn the heat down to medium and let the tomatoes simmer until they just start to break down, about 4-5 minutes. 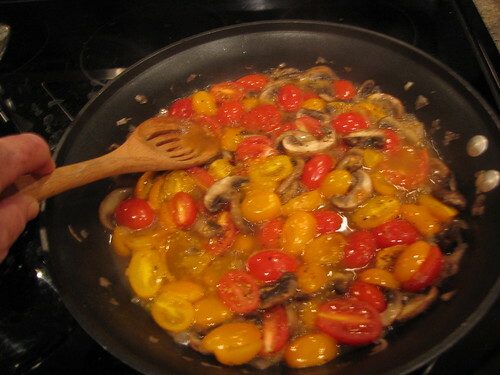 Use the back of a spoon to smash some of the tomatoes (about 1/3) to help make a saucier sauce. Add 1 pound of cleaned peeled and deveined shrimp to the pan. Turn the heat up to medium high and cook the shrimp quickly, only about 2 minutes per side. The shrimp are done when they are vibrant pink and the little edges have just started to curl. Don’t over-cook your shrimp. Season to taste with salt & pepper. For a little extra kick, you can add a few red pepper flakes. 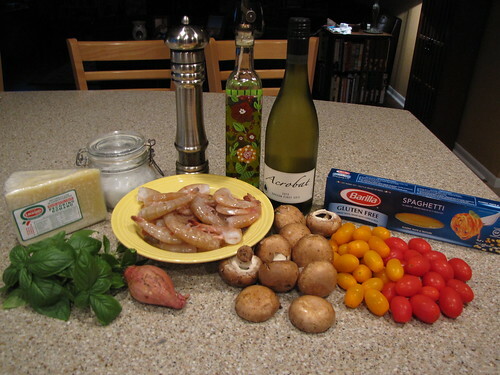 Divide the pasta onto plates or shallow bowls and top with the shrimp & tomato mixture. This is one of the pastas that I like to dish up separately rather than combine in the pan because it is easier to be sure everyone gets some shrimp, tomatoes, and mushrooms in their serving. Pour any sauce left in the pan over the pasta too. Top with lots of chopped fresh basil and pass the Parmesan or Romano cheese for grating. This dish is fresh and summery but since cherry tomatoes can be found all year long, you can have it anytime. It’s nice because the tomatoes stay mostly intact rather than dissolving into a sauce so you get a little burst of tomato flavor in each bite. Even though my love for Italian Sausage has been well documented here, I love dishes like Linguine with Shrimp & Little Tomatoes that are lighter and full of fresh flavors. I can practically smell that cooking. Thank you for visiting! It’s great that we can share food all around the world. I LOVE Korean food but haven’t really ever tried making it at home. Maybe you will inspire me to try something new. Welcome!! !